Fiona at SXSW this spring. It was 1999, my freshman year of college, when Fiona Apple’s When The Pawn… dropped. I don’t know if I would have called myself a fan of Apple’s at that time. I had picked up her first album in Junior year of high school thanks to the recommendation of my computer programming teacher, and saw her twice on the tour behind it. Though I grew to love Tidal over time, it was always a little sleepy for me at the time. I loved “Sleep to Dream” from the start, plus “Criminal” and the thrumming “Carrion,” but on the whole it was subtle for my teenage years. So I can’t tell you exactly why I picked up When the Pawn… If only I had started a blog a year earlier! What I can tell you is that I thought – and still think – that the LP is a work of utter genius. Every song is an incredible feat of songwriting. Fiona’s voice is throaty and lush. All of the arrangements are imaginative without being over-bearing. It is a five-star effort that I still listen to front to back almost once a month. I followed all the Extraordinary Machine drama and, as you may recall, I didn’t love the finished product. I did still love the songwriting. It was another all-genius every-time effort. That’s not easy to do twice in a row, especially on your second and third releases! I was notably cooler in my zeal when Apple’s The Idler Wheel… was announced earlier this year. 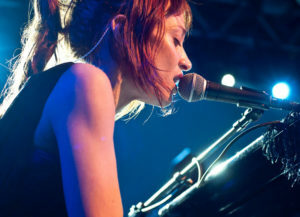 Sure, new Fiona Apple record – great! But who knows if she could keep up the genius streak or find the right sound for her songs. While many are fixated on single “Every Single Night,” I thing early leak “Anything We Want” is the pièce de résistance on this record. It’s the one song where the minimalist pounding-on-things style of found-sound production definitely doesn’t detract from a song that clearly has some intricacies built in. Also, the lyrics are quite genius – a story of seduction spanning time and space. Witness this clever device. That’s just stunning. The very oblique seduction in the first verse is resolved by very adult tryst in the final one. Yet, in the final verse she contrasts that lust with pretending that she’s eight years old. Kids kiss, and grown-ups take their clothes off. Is the “let’s pretend” a remembrance of her own youth with a now adult lover – a flashback to more innocent flirtations? Or, should we read the “Let’s pretend… then we’ll grow up” differently – that they are so effortless and comfortable with each other that they regress to their childhood selves and grow forward in the room together, until they are adult enough that he reminds her where she wanted to be kissed hours or days before, since forgotten? Stunning. The turn of the lyrics keeps me rapt every single time I listen to it. I want to believe Fiona Apple is healthy and happy at the moment – a recent giggling and quite normal appearance on Jimmy Fallon supports the theory. If she keeps laughing and living and releasing strong work, I’d say it was one of the best concerts I’ve seen in my life, and The Idler Wheel… is a brave experiment by a singer with a still-unbroken streak of excellence – even if it’s never the excellent we expect from her. Saturday night E and I were excited to score a pair of tickets to see Phoenix at The Tower from awesome XPN local music blog The Key. The seats were prime – slightly forward of the soundboard, just off the left aisle. 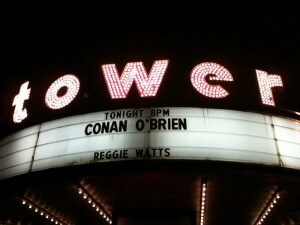 The Tower, as shot on my phone this June when we saw Conan there. The band came out swinging hard – a one-two punch of an intense “Lisztomania” and “Lasso,” followed shortly by a fantastic version of “Fences.” Vocalist Thomas Mars was a little lost in the mix against the heavy tom-focused drumming (two sets of them! ), but it’s not like intelligibility is a trademark of the band. “Fences” is what made me most excited, as its subtler, trance-ish elements translated perfectly from the record. The Phoenix show marks the first time I’ve ever left a concert before the encore when I was there to see the headlining act … and I’ve seen a lot of concerts. The performance itself was okay – nothing special – but I honestly don’t know how we could have possibly survived any more of that bass. I’m not sure if it was a bum night of mixing, faulty equipment, bad acoustics in The Tower, or some other circumstance, but if not for the interlude from Jenny and Johnny it would have easily qualified as the worst big concert I’ve ever attended. If the band meant it to sound that way they’re idiots. Much thanx to The Key for sponsoring this trip, even if it didn’t turn out as awesome as we had hoped. They’re a great blog! Read them! Okay, this is the last one, I promise. A recurring theme of “The Legally Prohibited from Being Funny on Television Tour” was all of the things Conan O’Brien isn’t allowed to do. He joked that not only is he prohibited from being funny on television until September, but he is prohibited from appearing on TV entirely and so are similar likenesses, such as Johnny Neutron and (hilariously) Tilda Swinton. Conan made a big deal over wanting to do his “Walker Texas Range Lever” bit for the tour even though NBC may hold the rights to that title. So, he instead presented “The Chuck Norris Rural Policeman Handle.” Each pull of the handle produced a riotously out-of-context Norris clip. The best part is Tina’s face after the third clip at 4:21. Priceless. Visit the “Legally Prohibited” tour Wikipedia page for the full list of guest appearances. Only the LA and NYC shows manage to trump Tina Fey and Trey Anastasio as special guests (the first night in Radio City Music Hall featured the ridiculous array of Stephen Colbert, Jon Stewart, Paul Rudd, Bill Hader, John Krasinski, and Vampire Weekend). Considering I originally bought my quartet of tickets to scalp for a profit to Conan-obsessed fanboys, I’d say that my attending the show and witnessing all of these hijinks this would be the highlight of my year if I wasn’t buying a house in seven days. And this is coming from someone who just jumped out of a plane and was almost murdered by pine barren monsters. I am an avowed unfan of Conan O’Brien‘s Triumph the Insult Dog, but even the stoic curmudgeon in me must admit that the execution of this bit was hilarious. At one point I shared a look with Melissa that indicated neither of us could breath from laughing so hard. Last night I saw St. Vincent play the final show of her US tour to a captivated audience at the First Unitarian Church. I have never seen a show at First Unitarian before (blasphemy for a Philly music-lover, I know). The show was upstairs in the church proper – a church in the warmest and most inviting sense, and with wonderful acoustics. It was a perfect fit for St. Vincent’s precise, melodic orchestrations. Backed by a woodwind player, violinist, bassist, and a spectacular drummer, St. Vincent stunned me throughout her set. I think I was most stunned because I got to take the show in alone and with no context – alone in my head, contending with such a remarkable show. I like going to concerts alone. For all the fun of sharing a music experience with friends, their proximity can take me out of my connection to the music. Are they comfortable? Can they see? Do they know this song? Why don’t they want to dance? Sitting solo at the end of a pew my connection to the music was direct – some songs found my gaze raptly on her fingers, others eyes closed and inside of my own head. As for context, I don’t really know anything about St. Vincent – I didn’t even know what instrument(s) she would be playing! That left me completely agog at how her five-piece recreated lush album arrangements with both fidelity and embellishment. Most of my St. Vincent listening is spent repeating first half of 2009’s Actor, so I was worried I’d be bored after she tore through spotless takes on “Save Me From What I Want,” “Neighbors,” “Laughing With a Mouth Full of Blood,” and a crunchy “Actor Out of Work” for her first four tunes. That boredom never came. Even as we tread into songs I recognized less, each was intelligible and compelling. Neither foreknowledge nor committing songs to memory were pre-requisites for enjoying the performance. I came away completely in awe of Annie Clark AKA St. Vincent. Her vocals were perfectly controlled throughout the show, on par with or besting her delivery on disc. Especially impressive was her guitar work, which is obscured beneath lush arrangements on LP. At the show it was much more prominent. On “Mouth Full of Blood” she navigated a series of classical-style walks and hammers, but she also worked fuzzed out riffs on the later “Marrow,” and an evocative solo and blast of utter noise on encore “Your Lips Are Red.” Also, her clean guitar tone was simply to-die-for. I have to applaud local promoters R5 Productions for the presentation. 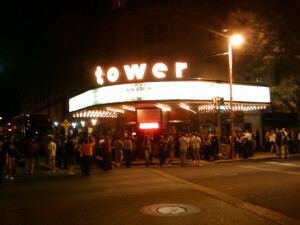 The show was sold out, but not oversold – everyone was comfortably seated. The mixing was utterly perfect, whether that was due to St. V’s front of house guy or a well plotted sound system (probably both). Altogether, a fantastic experience. I’m so happy that snow and slow SEPTA didn’t leave me couchbound for the night.